Davidoff Champion is a fresh and yet strong masculine blend of bergamot and Italian Lemon, over a heart of clary sage essence, orpur galbanum essence and a base of oak moss and atlas cedarwood. 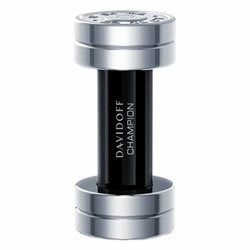 Davidoff Champion is housed in a chunky dumbbell with black-glass, with its head and tail as silver weights. Made of real metal with the contents boldly engraved on the cap, the bevelled-grip body gives a rough, masculine touch.